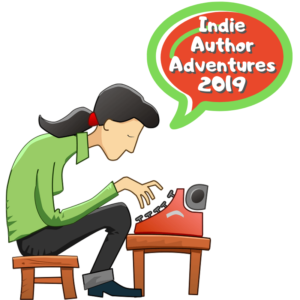 Welcome back to my adventures in indie-ing 2019 – were I’ll be sharing each week what is going on in my indie-author life, the struggles, the balancing acts, what works, what (really!) doesn’t, and all the in-between bits. Hopefully, along the way I’ll be sharing some tidbits and advice that other indie’s can find helpful, or at least some amusing morsels for my readers! This past week I inched ever closer to that brick wall that we all run into at times when we try to do too much for too long. It’s a fault of mine, I readily admit it — I have a hard time accepting that I simply cannot do everything that needs doing all of the time without any outside assistance. 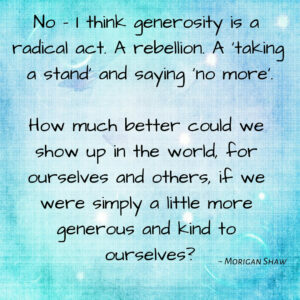 So, today, I want to talk a little bit about generosity. Huh? What the what? What’s that got to do with burnout, working too hard, and being a writer? I have a radical idea to share with you. Did you know that kindness, compassion, generosity, those are all facets of the same diamond? I know… I know… crazy, right? I didn’t know it either. But hear me out… there’s more. The indie-authors I have been blessed and privileged to come to know and call my friend throughout this journey are some of the kindest, most compassionate, and generous people I have ever met. Truly – not kidding, and not just ‘blowing smoke’. They are incredible people. During some dark times when I have wanted to quit, to throw in the towel, to say to hell with it all, it was — IN EVERY SINGLE ONE OF THOSE INSTANCES — an indie-author friend who sat with me through those rainstorms and reminded me of why I started doing all this in the first place. They shared their grace, their humor, their love of what we do… their compassion, kindness, and generosity of spirit has kept me going many times over. Very few indie-authors I’ve met know how to extend that same generosity (kindness, compassion) to themselves. And it was wonderful – and awful – and eyeopening. It was desperately needed, without a doubt. I also found that throughout the day I had to have little internal battles with myself – that little part of me what tried to guilt-shame me into “getting back to work”. And wow… that little internal voice can be vicious. Yikes. Why is it that we can be so generous with anyone else in our lives that we care about – but we cannot do the same for ourselves? Why would we sometimes give the very last dollar we have to help out someone who may be in worse shape than ourselves… but wouldn’t spend that same dollar on something that could help us? 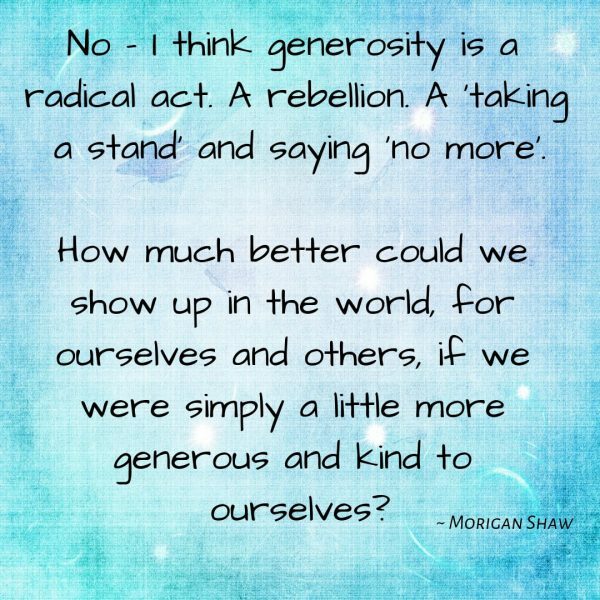 No – I think generosity is a radical act. A rebellion. A ‘taking a stand’ and saying ‘no more’. How much better could we show up in the world, for ourselves and others, if we were simply a little more generous and kind to ourselves? But – I digress. Short cliche version: Put on your own oxygen mask before you help someone else with theirs. You can’t pour from an empty cup, etc., etc. Did I get work done this past week? Yep, sure did – of course, no one else is gonna do it for me! 😉 BUT – I also learned that part of that ‘WORK’ that I need to do, that needs to be on my calendar every single week, is generosity – to myself. I can bring a lot more good to the world, both through my writing and as a human in general if I’m not a burned-out, exhausted husk of the person I can be. And I’d wager it’s the same for you.